The tree basins of Ringjsön in Skåne, Southern Sweden. 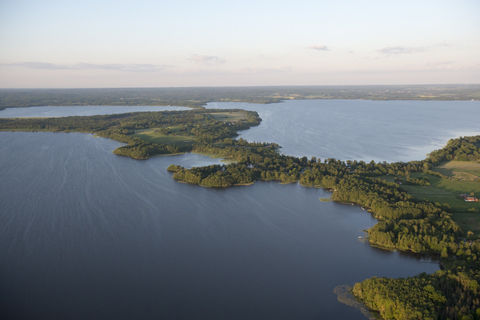 The Swedish Lake Ringsjön is the second largest water body in the region of Skåne (40 km2). It has been a mesotropic lake before it accumulated nutrients in the 1960’s and 1970’s from mainly agricultural activity. The lake is embedded in a multi-functional landscape with nowadays high recreational values in the upstream catchment from the Rönne river. The watershed area encompasses 1900 km2 and a river length of 90 km before leading into the Kategat sea. Main issue for the futureIntensive agricultural activities in the past resulted in high levels of eutrophication of the Rönne å water bodies. The water quality now is considered not good enough for regular drinking water use. The turbid lake and its toxic algae blooms thus became a major target of restoration activities by local municipalities. Iconic species Pike and pike perch used to be abundant predatory fish and it is a goal that they will become more abundant again as soon as the lake gets clearer. The water plant Elodea Canadensis, also called water pest, became apparent again only recently and is a sign of improving water quality. Types of uses The current regional human population size is around 100 000 and land use is 48% forest, 31%, arable, 6%, pasture. Water extraction is 67% for urban households and 24% for industry. Projected population growth in the watershed is 0.7% yr-1 and should increase demand on freshwater ecosystem services (fish, drinking water, recreation). Official actors The three municipalities adjacent to the lake (Höör, Hörby, Eslöv), drinking water supplier Sydvatten, agriculture association, sportfish association and more, all together represented within Ringsjön water council. Our agenda For a start, we want to invite all actors related to freshwater governance to engage in a dialogue to envision together the long-term future of how the water bodies are affected and used. The German Lake Dümmer is the second largest water body in the federal state of Lower Saxony and the flattest lake of Germany, with a maximum depth of 1.4 meters and a medium depth of 1 meter only. Its surface area is 13.5 km2 while the lake’s catchment area, that is the upper water basin of its tributary Hunte, has a surface of 337 km2. Having emerged in the last ice age, about 10.000 years ago, the Dümmer is part of a low moor and surrounded by wet meadows, low moor, alder marsh and alluvial forest. The lake lies in a EU bird sanctuary and its Western and Southern banks are nature reserves. It is home to an abundance of migratory and non-migratory birds that rest and hibernate at the lake and its surrounding wetlands. Main issue for the future Since the intensification of agriculture in Lower Saxony in the 1950s, the lake suffers a continuous and massive input of nutrients. The high amount of phosphate in the lake leads to its eutrophication and a structural change of its ecosystem: biomass production increases while less sunlight reaches the lake’s ground. Consequences are a decline of the submerged vegetation and a higher oxygen consumption. Moreover, the Dümmer was embanked in the 1950s and made a retaining basin to regulate the Hunte’s water levels. Due to the dyke, the increasing biomass and dead reed cannot be washed onto the wet meadows and stay in the lake. To avoid the lake’s siltation, the sludge has to be pumped out. In hot summers, the lake also suffers the growth of cyanobacteria – which feed on the nutrients – which cause the toxic so-called blue-green algae bloom. To improve the lake’s state, the Federal state plans the construction of a reed bed that would eliminate the nutrients in the lake’s water through a natural process. Iconic species The lake and its wetlands and moors are home to species listed by the European Habitats Directive (92/43/EEC) as in need of protection, like the spined loach (cobitis taenia) and the misgurnus (misgurnus fossilis), the moor frog (rana arvalis) and the two plants apium repens and bromus racemosus. A diversity of birds rest or hibernate at the lake’s banks, like the godwit, the curlew, the snipe, the peewit, the black tern and the osprey. Up to 50.000 ducks and gooses – among them the hen harrier, the wigeon and the shoveler – hibernate at the Dümmer. Ten formerly disappeared species returned to the lake as well, like the ruff, the redshank, the sarcelle duck, the pintail, the spotted crake and the corn crake. Types of uses About 46.000 people live in the lake’s region. The lake is a popular recreational area and lots of people come to the lake throughout the year to fish, sailboard, sail, or go for a stroll. The lake is also used as a retaining basin. Theoretically, the lake’s water would provide the surrounding wetlands and moors with water; however, the dyke hinders this natural fluctuation of the lake’s waters. Being surrounded by five nature reserves and lying in an EU bird sanctuary, the lake and its ecosystem provide habitat for an abundance of flora and fauna. Official actors The three administrative districts adjacent to the lake (Diepholz, Vechta, Osnabrück); the water associations Hunte-Wasserverband and Hunte Wasseracht; the so-called Dümmer council which is comprised of representatives from different sectors and in charge of the implementation of measures that aim to solve the lake’s oversaturation with nutrients; the environmental associations NABU Niedersachsen, Naturschutzring Dümmer e.V. and Natur- und Umweltschutzvereinigung Dümmer e.V. ; the nature conservation station Dümmer; the Chamber of Agriculture of Lower Saxony; the Federal State Administration for water management, coastal protection and nature conservation; and many others that will be identified still. Our agenda As a start, we would like to bring all actors with a stake at lake Dümmer together to talk about the different challenges the lake encounters today and will face in the future. Together, we want to envisage the possible ways in which the lake may be used and managed sustainably on the long run. Located 20 km north of Quebec City(Quebec, Canada),Lake St. Charles covers an approximate area of 3.6 km². The lake is the major water reservoir of the St. Charles River Watershed that flows from the lake into the St. Lawrence River. The lake became a semi-natural reservoir with a current capacity of 15 Mm3 after the reconstruction of the Cyrille-Delage dam in 1950 raising the water level approximately 3.6m above natural levels(the initial structure was built in 1934). Over the years, the urbanization impact has significantly changed the lake ecosystem from a meso-trophic to a meso-eutrophic status.The northern part of the lake drains an important protected wetland known as the Northern Marshes. Landscape The sub-polar, sub-humid climate together with the relatively low and mild slopes have favoured the development of an extended variety of maples, basswoods, birches and firs mixed forested areas and with a few wetlands. Agricultural and industrial activities have no significant impact, but residential development does. Main issue for the future Urban development continues to threaten the health of the ecosystem due to the increasing level of sediment and salt transported by the tributaries. Aging septic tanks and two municipal treatment facilities also release an increasing quantity of nutrients (N, P) and emerging contaminants. Stressors including invasive species, cyanobacteria, and water demand, in tandem with climate change, risk changing irreversibly the ecological characteristics and jeopardizing the provision of services by the watershed. 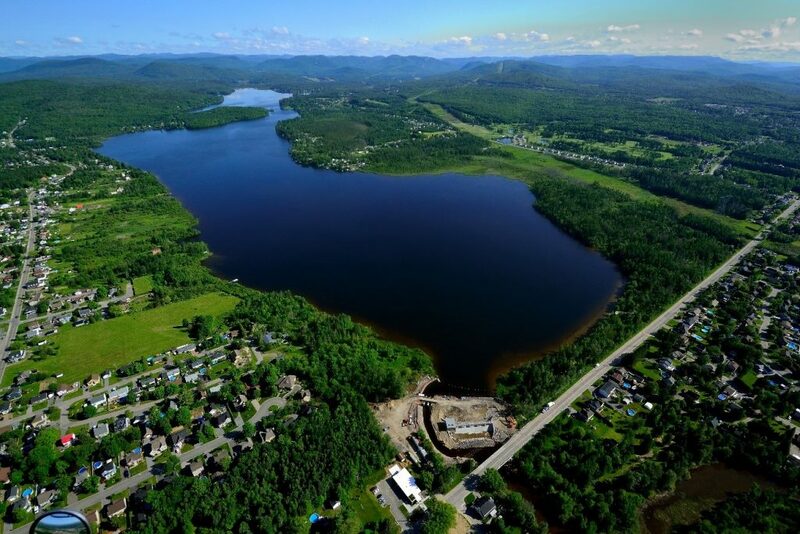 The Valcartier Canadian military base, located within the watershed contributes significant sound pollution to the lake area during training activities. The Integrated Water Resource Management approach adopted by the Province of Quebec in 2002 through the Provincial Water Policy has yet to provide the expected level of sensitization across the relevant stakeholder groups to promote definition of desired and sustainable watershed resource scenarios around Lake St. Charles. Iconic species and less known related to the issue The construction of the dam changed the lake’s physical-chemical structure, leading the disappearance of Lake Trout (Salvelinus namaycush). Seven fish species, relatively common to the region, currently populate the lake: Perch (Perca flavescens), Golden Shiner (Notemigonus crysoleucas), White Sucker (Catostomus commersonii), Common Sunfish (Lepomis gibbosus), Brown Bullhead (Ameiurus nebulosu), Smallmouth Bass (Micropterus dolomieu), and Northern Pike (Esox Lucius). In years when it was assessed, fish community composition varied (1983, 2005) but stabilizing in 2017. Aquatic plant communities show an increasing footprint of endemic species such as Potamotogeton robbinsii, Elodea canadensis, Brasenia schreberi, Vallisneria americana and Utricularia vulgaris as well as the presence of the invasive Myriophyllum heterophyllum. Four dominant genera of cyanobacteria (Anabaena, Microcystis, Aphanocapsa andAphanothece.) have become more predominant in the lake, especially since 2006. Types of uses Lake St. Charles offers year-round services. Fishing, canoeing, bird watching and hiking attracts a significant number of visitors from the region. Gas motors are prohibited from use on the lake. The Association for the Protection of the Environment of Lac St. Charles (APEL) maintains the infrastructure that annually allows 25 000 visitors to explore the Northern Marshes wetlands. The wetlands are also used for educational purposes, providing opportunities to universities and schools to study and research their critical ecosystem regulating function role in the watershed. Official actors and decision makers In Canada, water is owned by the federal government (Crown). However, despite this, the Quebec Water Policy allocates the management of this resource to the local municipalities. The riparian areas of the lake are mostly owned by the City of Quebec, and 20% by the municipality of Stoneham. Municipalities, with the support of watershed organizations such as APEL, provide the necessary support to implement and deliver the province’s integrated resource management approach. A local indigenous First Nations community (Huron-Wendat), located in the Wandake area along the banks of the St. Charles River, play a potential role. Our agenda Define the foundation to address the social aspect of building internal/external institutional, technical, financial, workforce capacity among stakeholders. Provide the bases for adaptive management value by providing mechanisms to resolve future scenario uncertainty and improve the understanding of management-system interaction.